Have you ever heard the saying, “If at first you don’t succeed, try, try again!” Sometimes it is so tough! 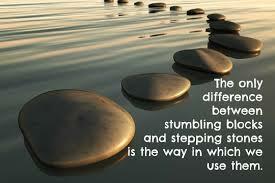 But remember that the only difference between stumbling blocks and stepping-stones is the way you use them. Here is a breath work and mindful movement practice I taught a group of High School seniors last week. Transform. Grow. Believe. Most importantly, TRUST!